I am a botanist, formerly working with the Royal Horticultural Society at Wisley Gardens in Surrey. Prior to that, I spent some years in the specialist nursery trade in north Lancashire and later in the Scottish Highlands. Since moving to Wales in 1994 I have undertaken freelance writing and editing for a wide range of publishers and publications. In the plant world, I have a special interest in woodland plants and ferns, especially those native to Japan, in which I have travelled quite extensively in the course of two visits several years ago. I have always enjoyed photographing plants and other wildlife in an amateur way. The development of digital photography, and software such as Adobe Lightroom have combined to give my photography a new lease of life. Recently, I have re-photographed two albums of photographs taken by my father in 1937 and 1938, in the course of two motorcycle tours in Central and Eastern Europe. The first was well-captioned, but the greater part of the second lacks any captions, which prompted me to attempt to identify the locations of as many photographs as possible. At some point in the future, when I re-vamp this website, I may add one or both albums to the gallery pages as I believe they are of some historical interest. I have now pinned down the locations of the majority of photographs, but a few still elude me. 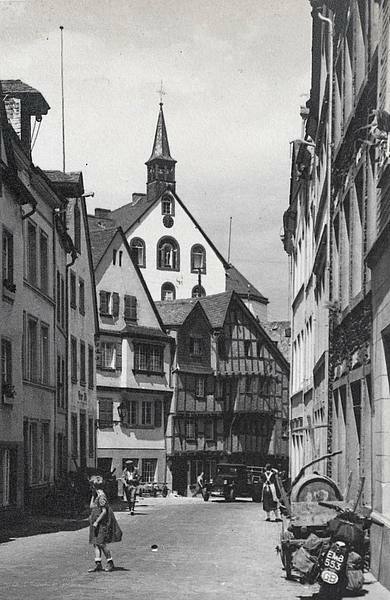 One I recently identified is this charming example of fachwerk — timbered building construction. This scene is in the small town of Bernkastel-Kues, on the Mosel(le) river to the southwest of Koblenz. Happily, the building, built in 1613, still exists today. 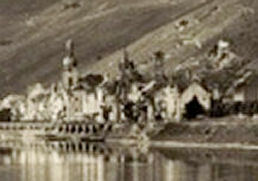 The next photograph in the album shows another small town also, I presumed, on the River Mosel. 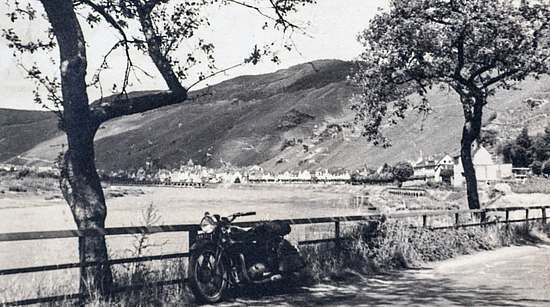 This I now know to be Zell an der Mosel, viewed from the south, near the turn-off to Kastellaun. I found an image of an old postcard showing a view of the church from rather closer to the town, in which the arched embankment is very obvious. The two crops (below) show matching details, including the arched embankment along the riverbank. 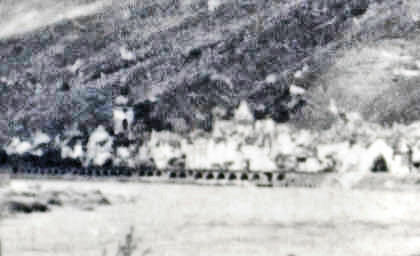 Crop from postcard of Zell, franked in 1940.